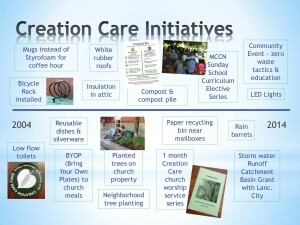 The Creation Care Committee was formed in 2007, and is funded by congregants through a Voluntary Gas Tax. Households charge themselves per driving mile to off-set their fuel usage, and this money then goes towards Creation Care projects around the church and community. Caring for God’s creation as a church community and learning to be good stewards of natural resources is a theme we’ve integrated into our church mission, life, commissions, and activities. We are encourage by the work Mennonite Creation Care Network (MCCN) is doing with the broader church, and glad to be a part of it.